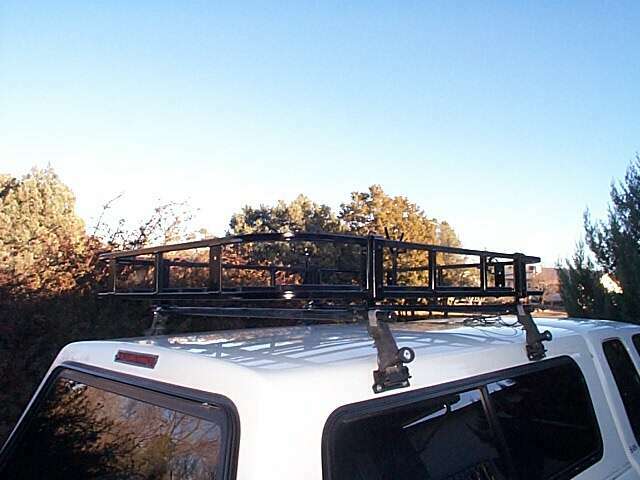 I installed the Wilderness Roof Rack prior to our trip to Baja. It came shipped in a compact cardboard container and I had to assemble it. The instructions were great and the assembly was easy. Many sizes are available, and I ordered a rack measuring 44" x 60" x 6" for my particular application. I wanted a rack that would maximize space above the camper shell, without hanging over. I have had the rack since the fall of 1999 and it has held up extremely well. 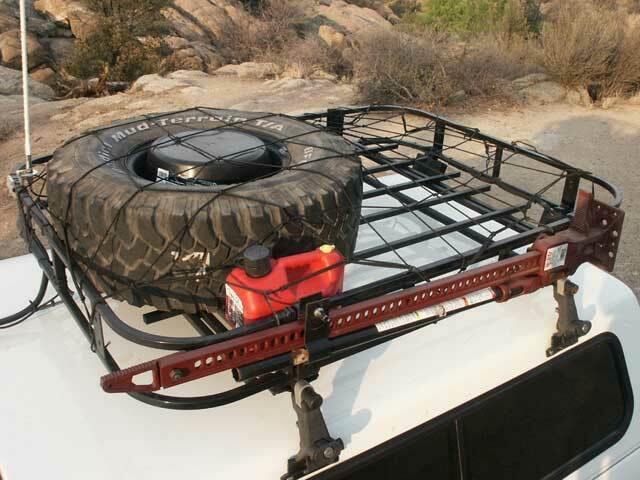 It has proven very durable and capable of handling heavy loads in off-road conditions. It has also been easy to modify for my needs. Initially, I wanted the rack to be removeable because I was using a Yakima rack system to carry my canoe or dual canoes when necessary. I also didn't want to have to drill any more holes in my camper shell. 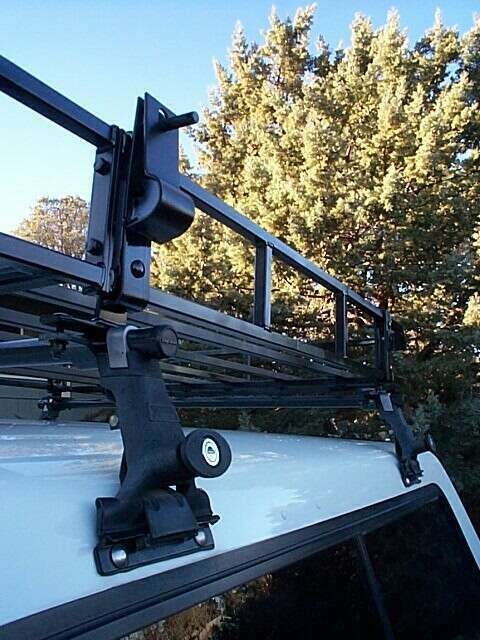 So, I really liked the Wilderness Rack because it easily installs on an existing Yakima cross-bar system with the use of special clamps made just for the rack's "feet" to bolt to. At first I was a little uneasy about the looks of the added height that the Yakima bars gave the rack. 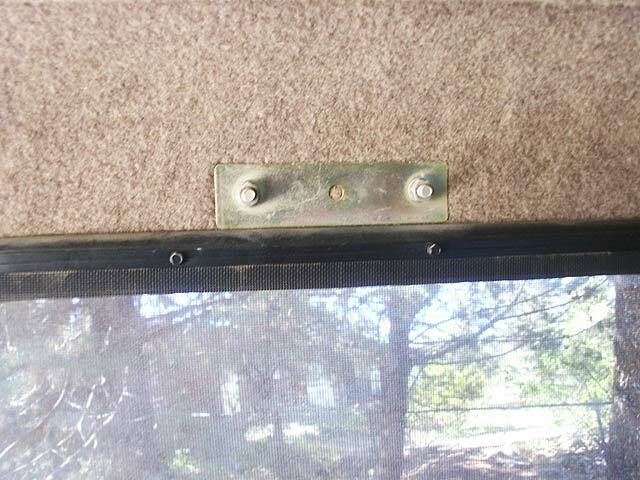 But it actually makes it much easier to wash the top the camper and run straps or bungee cords under the rack when fastening items down. 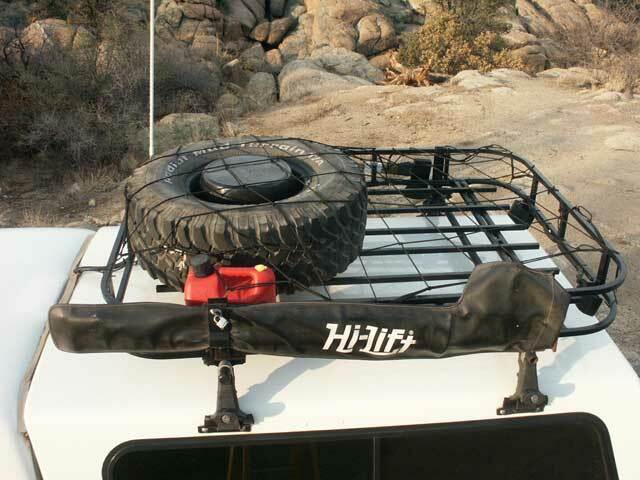 Here is a close-up view of how the rack mounts to the Yakima cross-bars. You can also see the forward bracket for the "Loc-Rac" Hi-Lift jack mounting system. Garvin Industries offers a mounting system for the Hi-Lift, but I found this one to be less expensive. As the name implies, it allows the jack to be locked while mounted. The use of the Loc-Rac required drilling mounting holes in the rack structure. The Yakima towers rest on Yakima "rails" which are fastened to the camper shell. The fiberglass shell is essentially "sandwiched" between the rails and these plates on the inside of the shell. Here is a shot of the Hi-Lift jack mounted to the rack using the Loc-Rac system. This location allows fast and easy access to the jack. I use a cover for the Hi-Lift to keep it in good condition. I've had the cover on since the roof rack was installed and it seems to be holding up very well. It's kept all of the miles of dirt, dust, rain and snow off the jack, so keeping the jack in good working order is much easier.